It was exactly one year ago on Mother’s Day that I received a phone call from my then 8 year-old daughter, Ella’s neurologist. Yes, my 8 year-old had a neurologist, and after that phone call, she had a couple of them. You see, in trying to determine the cause of spells she had been experiencing, that made her lose vision and have distorted hearing for a few terrifying seconds, sometimes leading to her thrashing around while screaming, “I’m dying!” her doctor saw a bubble-formation in her brain. And that Mother’s Day, the neurologist called to tell me that my sweet girl had a brain aneurysm. 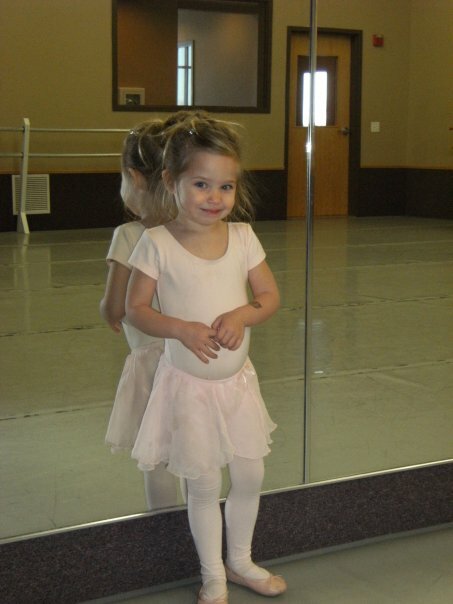 Ella, age 2, at one of her first ballet classes. Exactly one week later, Ella turned 9. We didn’t have a birthday party with her friends. She was sad and scared, and when I asked what she’d like to do for her birthday, she said, “I don’t really want a party. I just want to go to Grandpa and Grandma’s farm and play with the kitties.” It was a weird birthday. We celebrated and smiled throughout the day, but there was a cloud of worry that hung over all of us. I spent weeks snuggling with her until she fell asleep each night, assuring her everything was going to be okay…waiting until I was certain she was sleeping before I would let myself cry as I begged God not to make me a liar. She had to be okay. She was so young, and such a tiny powerhouse of personality and joy. One year later, after lots of doctor visits and testing, we now know that what was thought to be an aneurysm is just a funky, donut formation in a blood vessel in her brain, and her “spells” are being successfully treated with anti-seizure medication. Somewhere in the midst of that chaos and fear, I had an epiphany.”Life could be so short.” We all know that in theory, but I’ve never been faced with it so bluntly. 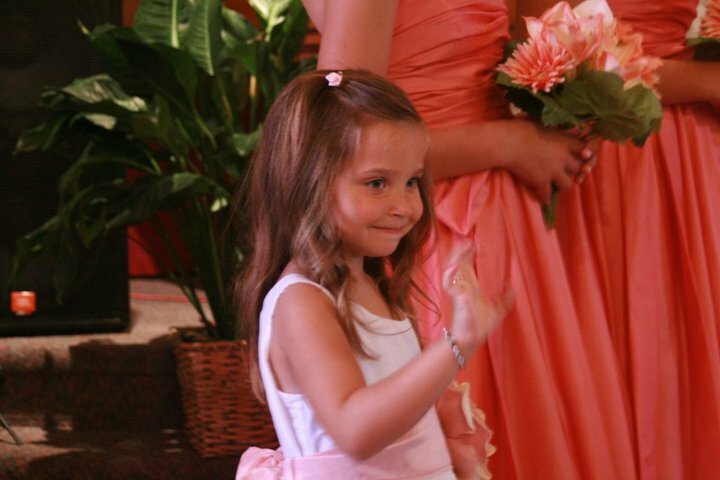 Ella, age 5, quite possibly the cutest flower girl ever!! I’ve always tried to live with Matthew Wilder singing “Aint nothing gonna break my stride. Nobody’s gonna hold me down…” in the back of my mind, but now I’m even more determined than ever to make the most of every second, leave nothing undone that I truly want to do, and when my kids have a passion, embrace it! Her first recital, age 4. She fell out of bed that morning and broke her collar-bone. 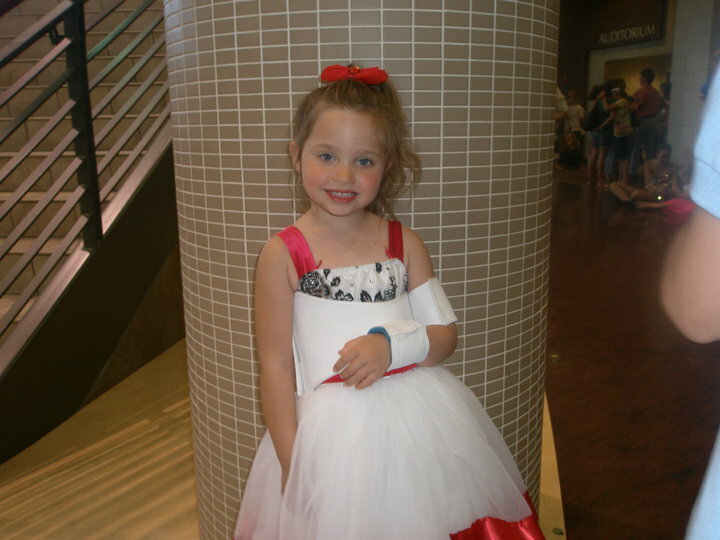 We told her, she didn’t have to dance…she was broken and in pain, but she refused to miss her performance. Already, showing signs that she is made of tougher stuff! 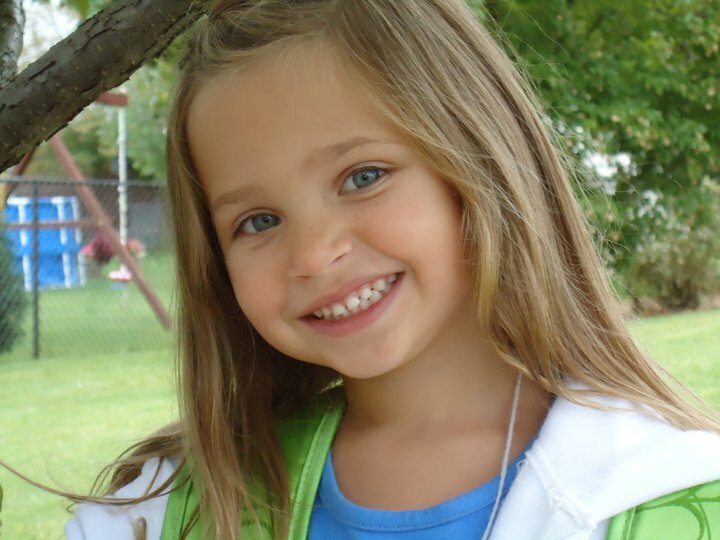 One of my favorite pictures of Ella…just before she boarded the bus to go to her first day of kindergarten. Ella’s passion has always been performing, and during the scariest part of our ordeal, when we thought she had an aneurysm in her brain that could burst an any moment, she asked to take a ridiculously expensive acting workshop that concluded with an audition in front of a panel of talent agents. At that moment, she could have asked for the moon, and I would have found a way to get it for her. So she took the workshop, and was offered representation by two agencies. Inspired by the fact that she now had an agent, we went to an audition at the world-renowned Guthrie Theater. There were so many kids there, and Ella, who was still undergoing testing to determine the treatment for her spells, was nervous she might have one during her audition. I told her, “We’re not gonna let those spells hold you back from doing what you want to do. We’ll ask God to keep the spells away long enough for you to get through your audition. If you want to do this, do it!” So she went in, did her thing, and we drove home giggling about how her voice cracked when she sang her solo, and she had to ask to start over. 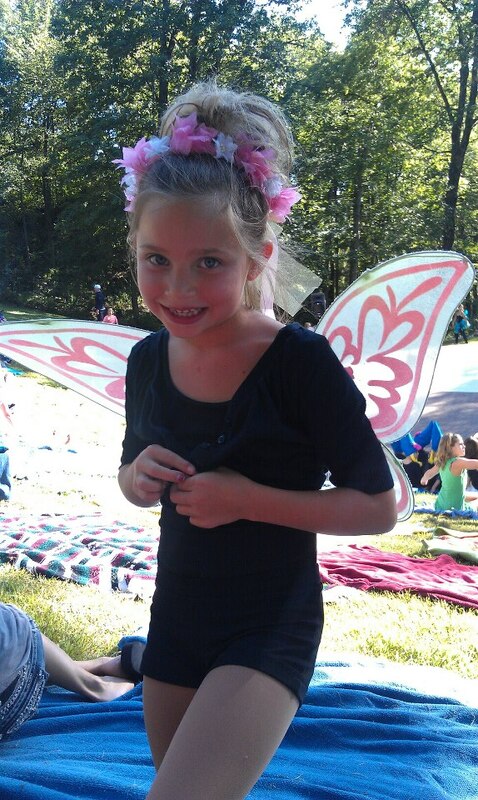 Rocking her fairy wings before performing on stage at a local amphitheater. Despite her crackly voice, which I imagine she played off with one of her silly faces and her huge smile that has been melting my heart since her first infant gas-bubble (you know the ones, “Oh look, the baby’s smiling! **Toot** “Oh, it was just gas.”), and even though she did have a small spell while she waited for her turn to audition…despite the fact that several of the kids she auditioned alongside were returning actors who had been in productions with the Guthrie and other theaters before…despite all the odds against my little first-time auditioner, she landed one of the two credited girl roles in the musical! Waiting backstage at the Guthrie Theater for her final audition. I’ll never forget seeing all the other kids being released from the room we waited in backstage, and Ella remained with just 3 other girls. Ella and I looked at each other, our eyes big, our mouths dropped open and I said, “Holy crap! You might actually get a role!” (yes, I said crap to my 9 year-old, but as a farm-kid, crap was never really a bad word…it was what we shoveled into the manure spreader so Dad could use it to fertilize the crops – it’s the one “bad” word my kids can say freely – my son inserts it into sentences whenever he can, which, when you’re a 12 year-old boy, is a whole lot) . So after a year that made me cry from sadness and sob from fear…after the year, I can only classify as the scariest time of my life, Ella’s enjoying her last week at school before she begins a full-time rehearsal schedule for her first paid acting job at one of the most prestigious theaters in the US. 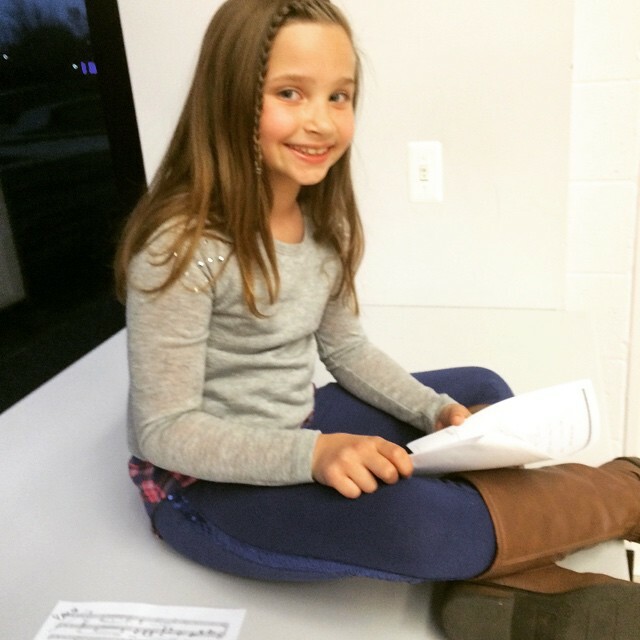 One year later, I’m juggling my own career as an author with my 9 year-old’s audition schedule. I’m getting messages from her talent agent telling me she’s been requested to audition for roles in BIG things (which I’m not allowed to talk about because my daughter won’t let me brag about her – although, I sort of am, and I totally don’t care because she deserves it…but, dude, we’re running lines for shows we’ve watched on TV)! One year later, the little girl I wanted to cover in bubble wrap and stick a bike helmet on every time she left for school because I was afraid one knock to her head could kill her…that little girl is doing BIG things and living her dream. 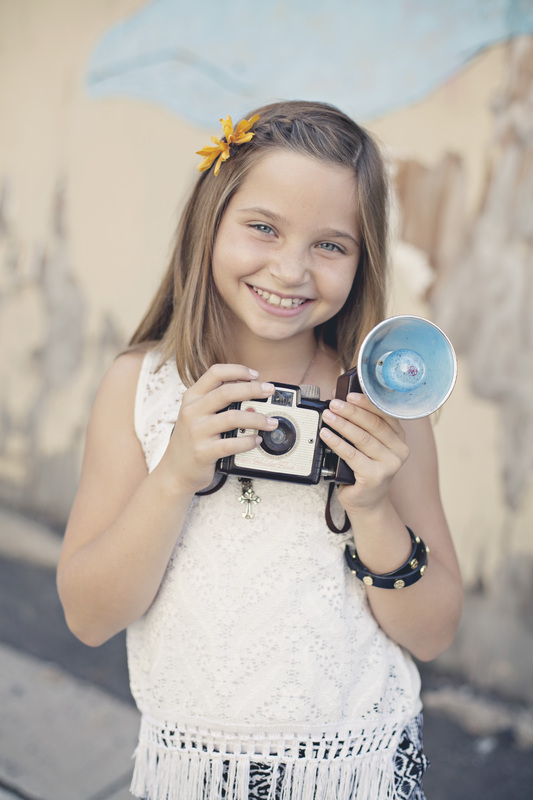 One of Ella’s headshots for her talent agency (courtesy of Shelley Anderson Photography)…healthy, happy and radiating her beautiful spirit! She’s like this beautiful work of art with a titanium core, coated in concrete…she’s one tough kid…but on the outside she’s all flower petals and butterflies, dusted in glitter. So this entire week, I’m celebrating her awesomeness, not just because in a few days she turns double digits (which we are celebrating with her friends at the biggest water park around), but because through this year from h-e-double-hockey-sticks (sorry, I can say crap, but I’m not allowed to say that one), she has persevered. She crawled through the muck and came out stronger, braver and more beautiful than ever…it’s that kind of beauty that radiates from her soul. Such an amazing story! You are such a wonderful mother!!!! …coming from another wonderful mother, that’s a huge compliment!